whole food concentrates, Helps in receiving well-balanced nutritional support, for up to 8 hours. It offers advanced nutrition to ensure that you are getting the most potent forms of key nutrients for feminine health, in one convenient formula. Vitamins A, C, D & E, which are essential for immune health. Folic acid, an important vitamin for women. In particular, healthful diets with adequate folate may reduce a woman's risk of having a child with a brain or spinal cord defect. B vitamins to help with the stress of daily living. Women's Bioactive Complex, a potent blend of specially selected "female-friendly" herbs including Vitex, Black Cohosh, Dong Quai, Red Clover and Soybean Concentrate. Calcium, the primary mineral responsible for strong bones. Omega 3 & 6 lipids, essential for balanced health. In addition, it is founded on the principle that whole food concentrates derived from whole foods are really the best approach to proper nutrition in a supplement delivery form, because they provide the beneficial phytochemicals found in fruits and vegetables that are not available in some supplements. Whole food concentrates allow us to reap the natural goodness from a broader nutritional spectrum, and offer an abundance of health benefits. 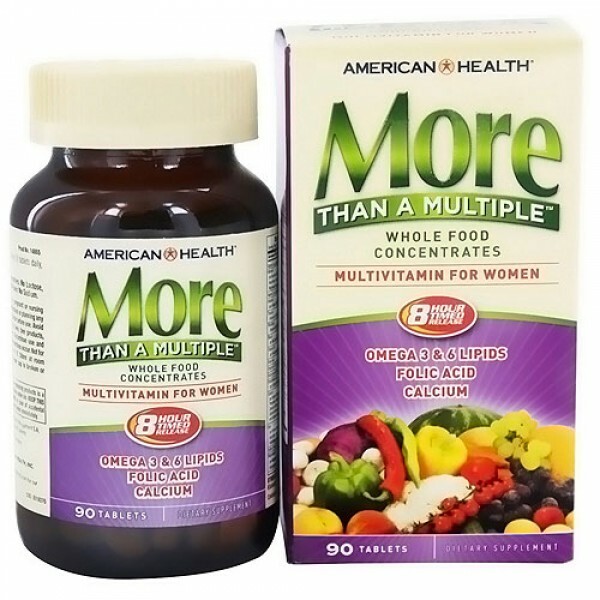 More Than A Multiple for women is specially formulated for timed-release delivery, so you can be sure you are receiving well-balanced nutritional support, for up to 8 hours! Sorbitol, Gamma Cyclodextrin, Cephalins (Phosphatidyl Ethanolamine and Serine), Xanthan Gum, Inulin, Stearic Acid, Magnesium Stearate, Alfalfa Juice Concentrate, Cellulose. Contains wheat, soy and fish (shark) ingredients. Free Of: Yeast, milk or milk derivatives, lactose, sugar, preservatives, artificial color, artificial flavor, sodium (less than 5 mg per serving). For adults, take three (3) tablets daily, preferably before meals. If you have never taken bee products, start with a small serving per day and increase gradually in order to assess whether you are allergic. As a reminder, discuss the supplements and medications you take with your health care providers. Not intended for use by pregnant or nursing women. If you are taking any medications or planning any medical procedure, consult your doctor before use. Avoid this product if you have Wilson's disease or allergies to bees, bee products, tomatoes, sunflowers or daisy-like flowers. Discontinue use and consult your doctor if any adverse reactions occur. Not for use by persons under the age of 18. Accidental overdose of iron-containing products is a leading cause of fatal poisoning in children under six. In case of accidental overdose, call a doctor or Poison Control Center immediately.